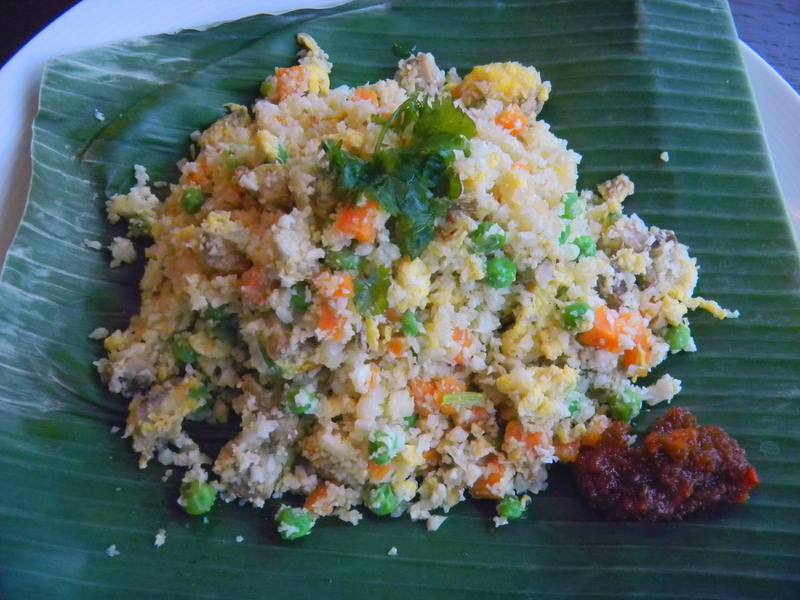 cauliflower rice | Yikes! No Carbs Please! If you have come to this page through a search engine looking for a genuine claypot chicken rice recipe, this is NOT it. I’m afraid there is no rice in this recipe and it is not cooked in a claypot! My blog is a low carb blog and rice does not belong here. If you are low carbing, do read on. One of my favorite dishes while living in Singapore was Claypot Chicken Rice. Chicken, shiitake mushrooms, Chinese sausages and salted fish are marinated in a sauce and then cooked over a layer of rice in a covered claypot. The juices from the ingredients and the extra marinade are absorbed into the rice grains while cooking to create a fragrant dish where all the different flavors meld into one. As the claypot is placed over a gas flame to cook, another characteristic of claypot rice is the burnt rice crust at the bottom of the dish which people look forward to when they get to the bottom of the pot. The best part comes at the end! 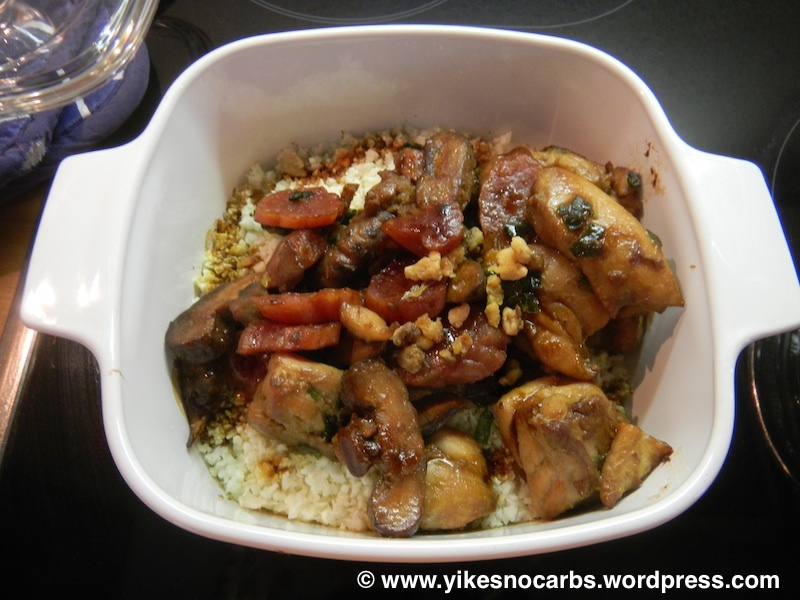 Trying to re-create this dish as a low carb version without a clay pot and using cauliflower instead of rice means having to accept that there won’t be any crispy bits to pry out from the pot at the end of the meal. I have no problem with this. We enjoyed our lunch today so I’ve decided to share this recipe. My low carb version has all the traditional ingredients except for the rice. I got as close as I could get by cutting out carbs where possible and cooked the dish in Corningware. Any pot with a lid which is oven-proof and large enough to hold all your ingredients will suffice. This recipe would also work without chinese sausages and salted fish. Chinese sausages and salted fish do, however, give the dish its distinctive taste but if these are items you don’t think you would enjoy or want to have the balance sitting in your pantry for months, don’t bother buying them. Just put in some broccoli, bok choy or other green leafy Chinese veggies instead. Of course, the end result will taste very different. In my recipe, I’ve fried the salted fish till slightly crispy and used it as a topping. Traditional recipes throw the salted fish in to cook with the chicken. Last week, my neighbor gave me a plaintain. I don’t eat bananas anymore because of the high carbohydrate content. So this solitary plantain sat on my kitchen counter turning slowly from green to yellow to yellow speckled with black spots. To throw or not to throw? I always feel guilty when I throw food away. This goes back to the time I was growing up and reprimanded by my mum for not finishing my meals – ‘Think of all the starving children in the world’, she would say. Although I now know that I won’t be saving any starving children if I leave food on my plate, I do however, make an effort not to waste any food, cooked or uncooked. Hence my decision to use up the plantain! To try to reduce the carbohydrate content of the dish a little, I decided to make the rice with cauliflower rice. And instead of serving the beans on the side which would mean that you would eat more beans, I decided to put it into the ‘rice’, just like in gallo pinto. Gallo pinto, if you speak Spanish, has nothing to do with yellow roosters nor is it a dish made with chicken. It is white rice mixed with black beans and flavored with onions, coriander and Salsa Lizano. Some people add chopped bell peppers. It is awesome. Salsa Lizano is hard to come by in Europe and the closest sauce I had to it was HP Steak sauce. I also did not have any bell peppers – I like to add red and/or green for colour. Anyway, so I made this pseudo gallo pinto and served it with grilled chicken breast, sautéed plantains and a small salad. It was delicious and I got rid of my plantain! 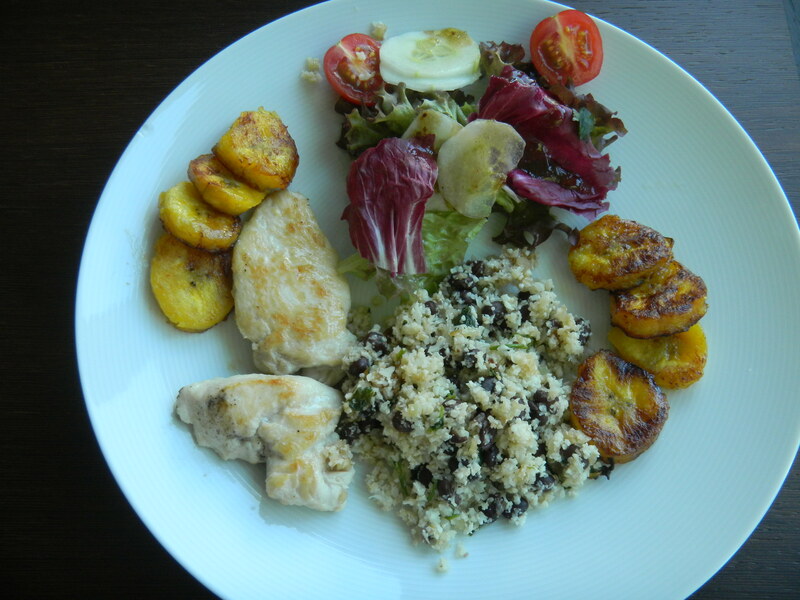 Of course, with the plantain and beans, this meal was not very low carb but let’s say it was carb-reduced. There is really no recipe to share here except for the rice bit. Instead of chicken, you could serve it with pork, beef, fish – grilled would be nice. Although Costa Ricans do not eat casado with tofu, there is no reason why you can’t replace the meat with tofu or even a seitan schnitzel. Then add a healthy portion of salad with a simple dressing. No need for plantains although they do add some nice colour to the photo above, don’t they? Place the riced cauliflower in a glass dish and microwave on high for 4 minutes. Sauté the onions (and peppers, if using) in a pan with some olive oil till glazed and lightly golden (and peppers are cooked). Add the beans. Sauté for 2 minutes more till warmed through. Add the cauliflower rice and chopped coriander. Mix well and season with the sauce. I used about 1 tablespoon but you can increase the amount to your liking. Dish out and garnish with fresh coriander.